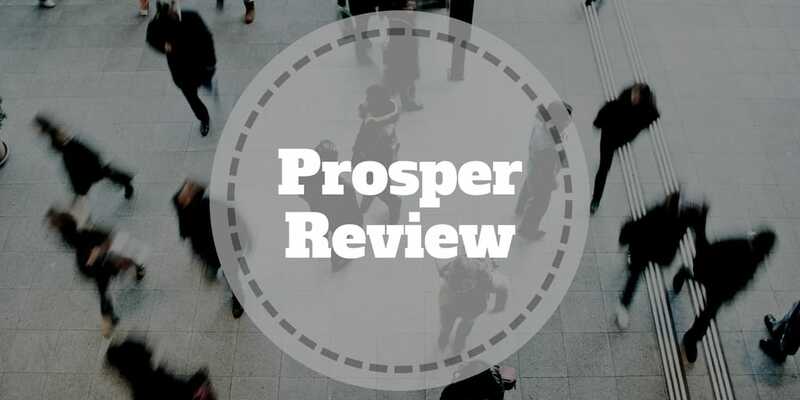 Prosper is a marketplace that connects borrowers in need of capital with lenders, also known as investors, who are seeking a return on their money. The minimum loan amount starts at $2,000 while the max loan amount is $40,000. Funding timelines are fast – you can receive money in as soon as 1 day and up to 3 days. Prosper ranks among the best personal loan options for good credit borrowers, and it’s one of the most popular lenders. Since 2005, Prosper has loaned over $13 billion to nearly one million people. Its “twist” on lending is that it connects borrowers with lenders. Unlike SoFi personal loans, which are issued by SoFi directly, Prosper loan money comes from lenders on its marketplace. Like SoFi, you will need to have a good credit history to qualify for a loan. A minimum FICO credit score of 640 is required. However, the average credit score for a borrower is 710. You will also need to have a minimum of 2 years of credit history, though the average borrower has established over a decade of credit history. Beyond credit score and history, Prosper evaluates hundreds of other factors to make a risk assessment. For example, a borrower with a debt-to-income near 50% may be viewed as high risk. If you have a letter grade of AA, you will generally pay the lowest APR rate and lowest origination fee while a HR designation will result in a high origination fee and high APR. Prosper states that any bankruptcies in the prior 6 months may disqualify loan approval. Prosper hidden fees and prepayment penalties fees do not exist, however you should pay attention to other lending fees. Repayment terms span anywhere from 3 → 5 years on average. While Prosper will not charge you a penalty fee for paying off your loan balance early, you will be hit with fees if you pay late, via check, or have insufficient funds. The primary costs are from interest rate payments and origination fees. Borrowers can quickly receive rate quotes and, upon approval, receive money within 3 business days. From start to finish, it takes between 1 to 3 days to receive your monies. Debt consolidation is a common reason for borrowers to select Prosper. For a borrower with say $10,000 of credit card debt who chooses a Prosper loan, we will assume a 3.5% origination fee applies. That means 3.5% of the $10,000, or $350, is deducted before the monies are transferred to the borrower’s bank account. So, the borrower receives $9,650. If you expect you will need the full proceeds that you apply for then it is best to account for this deduction due to origination fees. Prosper investing is an attractive alternative to the savings rates offered by traditional bank savings accounts. 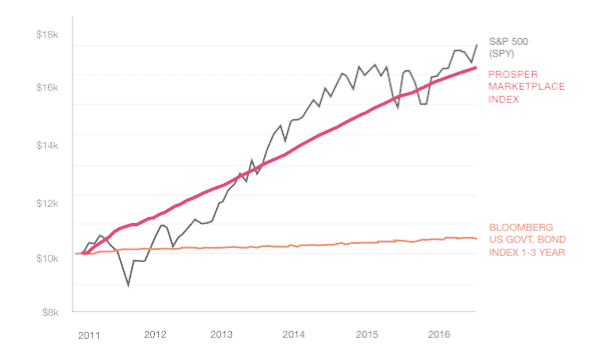 Compared to stock market investing, it also offers the potential for passive income without worrying about whether there will be a stock market crash. Investors can diversify away from the stock market and real estate asset classes by investing in high-income professionals with above average credit scores. The average annual return of 7.41% earned by Prosper lenders knocks the socks off the yields offered by conventional savings accounts during the period shown from January, 2011 to December, 2016. Over 83% of active investors on the Prosper platform reported returns that met or exceeded their expectations, and it’s no surprise why when you discover that the average borrower has an income of over $88,000. Investors are compensated based on the risk levels they take. When you loan money to a Prosper borrower who falls into a high risk category, you can expect to earn higher returns. And vice versa, lower risk borrowers translate to lower returns for investors. A doctor looking to consolidate debt may present lower risk than a self-employed individual starting a business for example. You can start investing with as little as $25 if you wish. ✅ Above Average Credit Score Borrowers: Borrowers have higher credit scores than the national average, which is a positive for investors, and provides an incentive to borrowers seeking loans to improve their credit ratings. ❌ Geographic Restrictions: Most states are covered but residents in some states are prohibited from using the Prosper platform. ✅ Fast Access To Cash: Loans can be issued in as fast as 1 → 3 business days. ❌ High Debt-to-Income Ratio: Debt-to-income ratios above 50% (excluding a mortgage) are not permitted but that is still quite a hefty debt burden to carry, which may pose higher risk to investors. ✅ Graded Borrowers: Borrowers are graded according to risk profile. Borrowers with better grades pay less while investors can choose across a spectrum of risk profiles, term lengths and return rates. ❌ Range Of Loans: Prosper is great for borrowers in providing capital to fund a wide range of loans from home improvement to starting a business but for investors caution is warranted as borrowers in need of money for new start-up businesses may present higher risk than you can evaluate because you won’t have access to the finer details. ✅ Up to $40,000 Loaned: Anywhere from $2,000 → $40,000 can be loaned to borrowers but investors can loan out much more. ✅ Invest On Auto-Pilot: Investors can loan money to individuals or to a group of borrowers via notes using the Auto-invest tool. Approximately $2,500 spread across 100 borrowers in a note is sufficient to be diversified according to Prosper. ✅ No Hidden Fees: If you pay late or via check, you will be dinged but there are no hidden fees or pre-payment penalty fees. ✅ Low Investing Minimum: If you want to test out the platform as an investor or a lender, you can start with as little as $25. ✅ In-depth Loan Profiles: Prosper does an excellent job of displaying key borrower characteristics without disclosing any personally identifiable information, so investors can better assess the risk of default. Prosper is an early pioneer of peer-to-peer lending and has grown to become one of the pre-eminent marketplace platforms. It offers compelling advantages to both borrowers and lenders. The bottom line is Prosper deserves your consideration whether a borrower or a investor. For example, a three-year $10,000 loan with a Prosper Rating of AA would have an interest rate of 5.31% and a 2.41% origination fee for an annual percentage rate (APR) of 6.95% APR. You would receive $9,759 and make 36 scheduled monthly payments of $301.10. A five-year $10,000 loan with a Prosper Rating of A would have an interest rate of 8.39% and a 5.00% origination fee with a 10.59% APR. You would receive $9,500 and make 60 scheduled monthly payments of $204.64. Origination fees vary between 2.41%-5%. APRs through Prosper range from 6.95% (AA) to 35.99% (HR) for first-time borrowers, with the lowest rates for the most creditworthy borrowers. Eligibility for loans up to $40,000 depends on the information provided by the applicant in the application form. Eligibility is not guaranteed, and requires that a sufficient number of investors commit funds to your account and that you meet credit and other conditions. Refer to Borrower Registration Agreement for details and all terms and conditions. All loans made by WebBank, member FDIC.